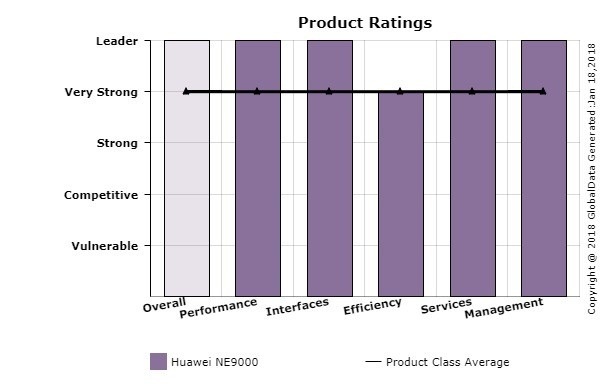 Consultancy and research firm GlobalData – formerly Current Analysis – has released a competitive analysis of backbone routers in which Huawei NE9000 was assessed as a leader in fields such as performance, port density, features, and architecture. Describing the NE9000’s technical advantages, GlobalData focused on superior forwarding capacity and scale, a diverse set of usage scenarios, operational efficiency and the support of Huawei’s traditional iManager N2000 and the Network Cloud Engine (NCE), which provides operators with a choice in how they deploy and manage their networks. Huawei’s NE9000 routers are now widely used to provide high capacity and multi-service bearing in IP backbone, DCI, IGW, and other scenarios at leading carriers in Western Europe, the Middle East, Southeast Asia, Japan, South Korea, and the Asia-Pacific region. Going forward, Huawei intends to continue innovation in IP core routers to help carriers create efficient networks that are sustainable in the long term and achieve commercial success in this new era of networking.